A collection of Sixties underground Rhythm and Blues, Psych and Soul. Every once in a while a compilation comes along that re-defines the genre. - Nuggets and Pebbles spring to mind; classic collections crafted with care. Cut from the same cloth is Rare Mod. Last year, Acid Jazz released a recently discovered and previously unheard EP from Steve Marriot’s pre-Small Faces outfit – The Moments. The record spent a couple of months in the indie top ten (peaking at number 4). 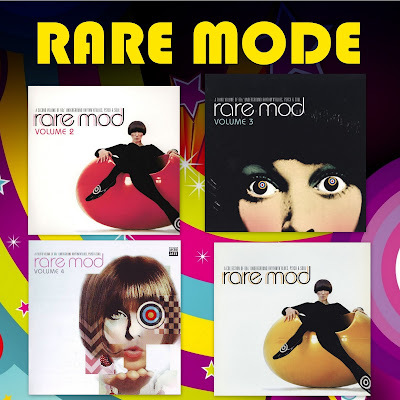 The label’s psyche guru, Richard Searle began a quest to unearth more super rare and unreleased material from the glory days of the mid sixties Mod scene. I am pleased to report that he was successful. 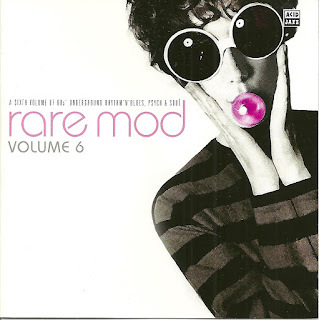 The end result is titled simply Rare Mod and features some of the finest unheard gems: tracks that were never released at the time, demos and obscure 45’s that were pulled within days of release. From obscure British soul (Truly Smith) though r n b (The Shots, The Doc Thomas Group), early psyche (The Attack, The Silence) to out-and-out mod classics (Steve Marriott’s Mo-ments, The Shapes Of Things) – all the genres and styles are represented and many of the musicians involved went on to massive success in later years. Mod is entering it’s 60th birthday and is once again growing as a cultural force – a new generation has discovered this most quintessential of British cultures. 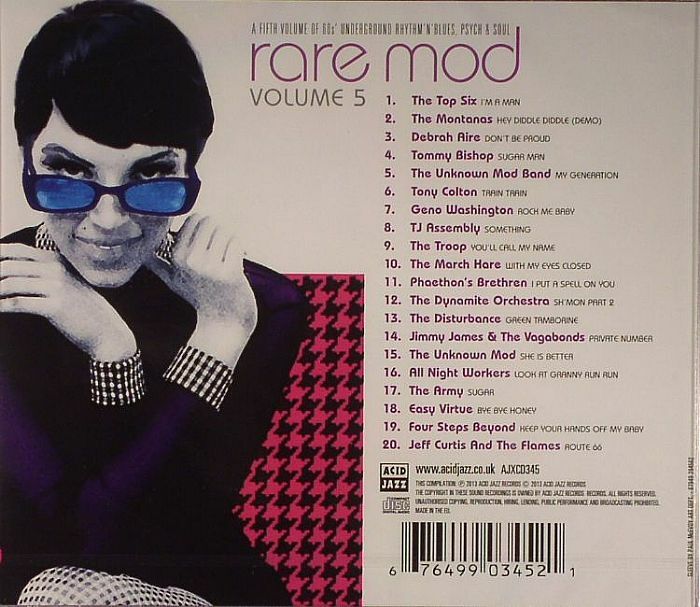 Acid Jazz are celebrating with the next installment of their highly successful RARE MOD compilation series. The east London indie has combed the attics and wardrobes of hundreds of original musi-cians and collected an amazingly broad cross-section of previously unreleased material. Acetates, demos and bona-fide unreleased songs combine on a hard hitting and commer-cially successful release. Volume one was released earlier this year to much acclaim and was described as a genu-ine rival to both Nuggets and Pebbles. Volume two is a step up in class and rarity. 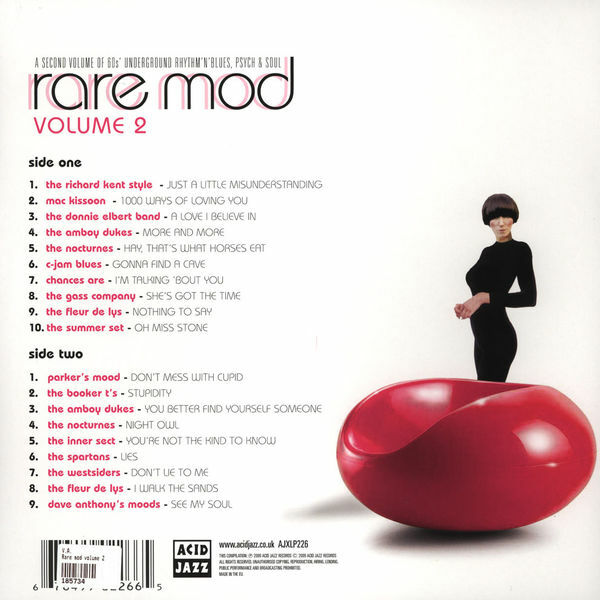 From obscure British soul (The Donnie Elbert Band and Mac Kissoon) though R n B (C Jam Blues, Parker’s Mood and The Gass Company), early psyche (The Nocturnes, The Amboy Dukes, The Summer Set) to out-and-out mod classics (The Fleur de Lys and The Richard Kent Style) – all the genres and styles are represented and many of the musicians involved went on to massive success in later years. With mod enjoying its highest profile in a generation, from Weller and Oasis to The Last Shadow Puppets and Twisted Wheel, this album showcases a whole host of brilliant, un-discovered anthems for old hands and new converts alike. 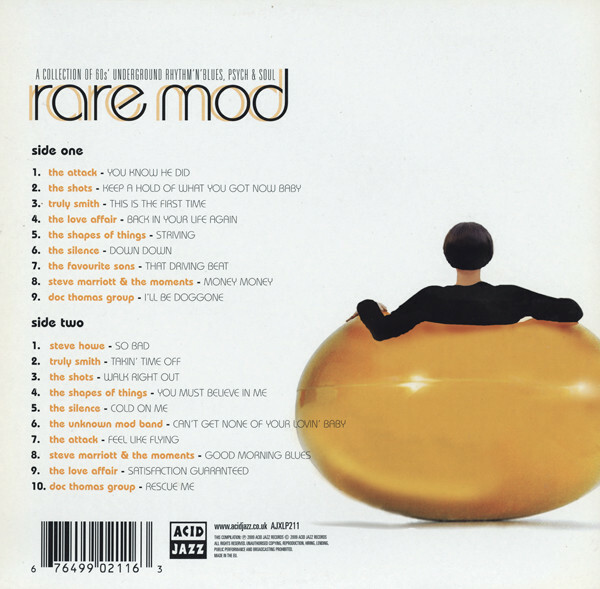 Compiled by and with sleeve notes from Paul “Smiler” Anderson and Damian Jones. Volume 3 sees the best collection yet - some of the finest underground mod, rhythm and blues and beat bands of the sixties, all digging out those unreleased acetates from on top of wardrobes, suitcases in the attic and in some cases, unheard studio master-tapes. On a 'mod' compilation you would expect mostly nothing but mod styled beat / garage / freakbeat, but there are a few exceptions. Take the London born Andee Silver who made this recognisable Motown pop single, here included. Female pop hardly is found on mod compilations, but there's another one. Goldie & The Gingerbreads, more being an American harmony vocalist band, found most of its success opening before The Rolling Stones and touring with The Kinks. Different but not in a too great sense also is the 'Northern Soul' band Kenny Bernard & The Wranglers, with another version of “In the midnight hour”, another connection to London. There are two tracks in earlier 60s styles and a few bluesier tracks included for one more London connection. 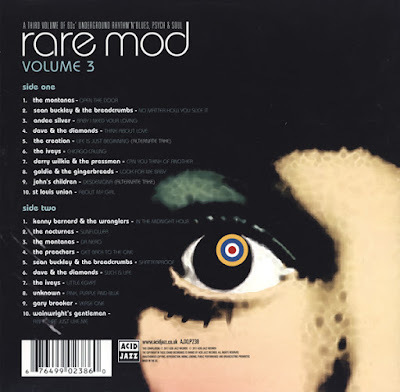 Such tracks makes the compilation a bit more alternated, while it is of course the mod connection which gives most of the expected / sought after satisfaction. There has been enough background info and a few rare photographs of many of the bands/recordings added. Nothing is completely surprising like mod hardly does for me, although a few songs could have made a bigger public with the right connections and circumstances. The compilation is already worth checking out for The Creation's Beatlesque string soaked song. And two albums, which our friend Daniel kindly shared with us. You've got some great stuff here but I can't fiw to listen to it. Any advice? 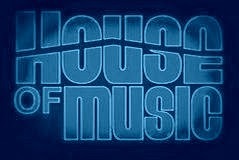 Hello, I've found out I had volume 5 among the mp3 I keep, do you want me to upload ? I saw also there was a volume 6, this one I don't have, sorry. Oh sure. It will be kind of you. Hello, just to say that I saw Daniel was quicker than me :) Anyway I missed last volume (now I have, thank you Daniel). I'm glad to help and share.